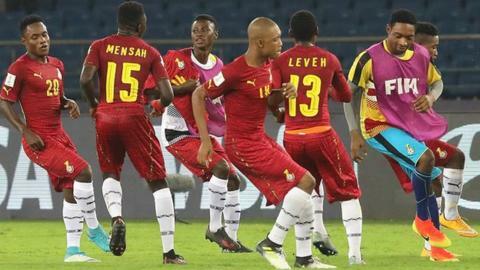 Ghana will meet Mali in the quarter-finals of the Under-17 World Cup after beating Niger 2-0 in Mumbai. Captain Eric Ayiah opened the scoring with a penalty in first-half stoppage time in the western Indian city. After 86 minutes, Ghana won another penalty but this time Niger goalkeeper Khaled Lawali saved Ayiah's effort. The Black Starlets were not to be denied for long as substitute Richard Danso wrapped up the win with Ghana's second goal in the 90th minute. Danso had been on the field just four minutes prior to his thumping long-range strike for the Ghanaians, who dominated throughout. Coach Samuel Fabin's side are looking to win the tournament for the third time after previous triumphs in 1991 and 1995. Meanwhile, Mali, who finished runners-up at the 2015 finals to eventual champions Nigeria, are seeking a maiden title for any age group at a Fifa World Cup. Both sides are the last African teams left in the competition following the elimination of debutants Niger, who leave India having won their first match at any Fifa World Cup at the finals, and Guinea.